Hotel Amrit Residency is located in the heart of Indore, just a short walk from the popular Treasure Island Mall and the business district. The hotel provides laundry services and spacious and elegant rooms with en suite bathrooms and free internet access. 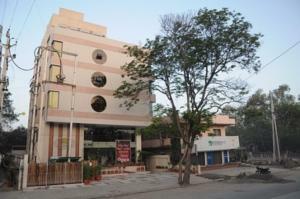 The hotel is only 8 km from Indore Domestic Airport and 500 metres from Indore Railway Station. Indore Bus Station is also about 500 metres away. The tour desk helps guests organise excursions to tourist attractions. The hotel provides car rental facilities for guests who wish to explore the region on their own. The rooms at Amrit Residency Hotel are air conditioned and equipped with a flat-screen TV, a fridge and a writing desk. Free toiletries are provided for guests’ convenience. Bay Leaf Restaurant provides delicious Indian, Punjabi, European and Chinese food in an elegant setting. Guests can also enjoy their meals in the privacy of their rooms. Free! One child under 4 years stays free of charge when using existing beds. One further older child or adult is charged INR 500 per person per night in an extra bed. The maximum number of extra beds in a room is 1. There is baby beds in a room is 0 capacity for cots in the room. Any type of extra bed or crib is upon request and needs to be confirmed by management. Supplements are not calculated automatically in the total costs and will have to be paid for separately when checking out.